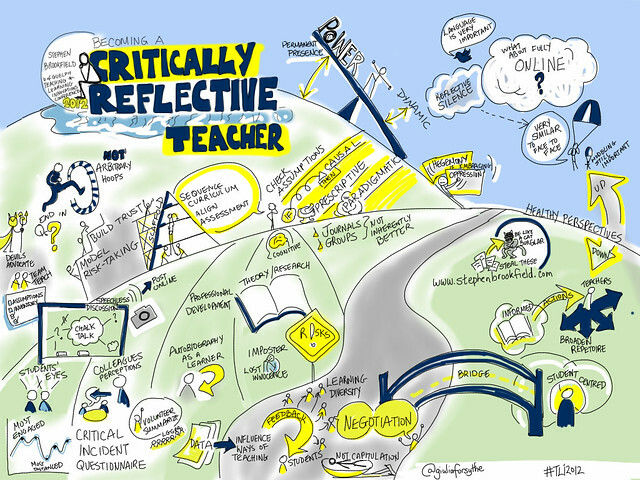 Brookfield #tli2012 Keynote: Becoming a Critically Reflective Teacher | Flickr - Photo Sharing! heyjudegallery, IleneDawn, and 10 other people added this photo to their favorites. Brookfield is a great speaker. Thank you Giulia for capturing this conversation for the rest of us to view. Giulia, this is a great visuaization of the session that day. Thanks so much - I'd like to refer others to it if it's OK with you. boggy brookfield for sure! please use any way you can. Hi Giulia, warm greetings from Manila.You have a very wonderful image on teacher reflection. I want to use your image in my video application for Google Teacher Academy in Manila this October 2014. I hope you won't mind. I'll share with you the final video when it's done. Thanks and have a great day! Hi, Giulia Forsythe hope you're doing good. Here is my video for the Google Teacher Academy in Manila this October 2014. Thanks for a great photo, I consider it the best photo I've seen about reflective teaching! Keep up the great work you're doing.